Farmers, also waiting to hear if they will be allocated more irrigation water, are getting worried about the effects of the delay. Rashid Khan, regional head of the Department of Water Affairs and Sanitation, said on Monday officials from the national department would meet on November 14 to decide whether they could increase the water allocation to Cape Town, surrounding towns and to the local fruit and wine farmers who have been badly hit by the drought and the 60% cut in irrigation water. Municipalities were placed under restrictions to cut water use by 45%. On November 19 the department officials will meet all the municipalities, irrigation boards and agricultural bodies that depend on the "big six" dams in the Cape water supply system and tell them what their decision is. "At the stakeholder meeting we will make known the decision from the department, and we will discuss the best way forward. Then what comes out of that stakeholder meeting will go back to national department," Khan said. The department will assess the feedback from the stakeholder meeting and make its final decision afterward. Khan said he was unable to say when the department would announce its final decision, but said it would be before the end of November. The total amount of water in the big six dams has hovered around 74% of storage capacity for the last two weeks - double the 37% it was this time last year. Khan said in the meantime the department had released irrigation water for the farmers on November 1 - the start of the new hydrological year. 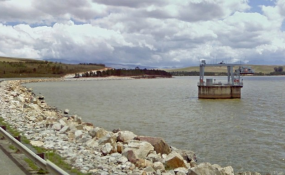 The Department of Water and Sanitation had cut off irrigation water once agriculture had reached its quota when dam levels were dangerously low. The water that farmers are getting now is from the new hydrological year's quota, but for the time being they are still bound by the 60% reduction until the department makes its decision on whether this cut can be reduced. Carl Opperman, CEO of Agri Wes-Cape, said the agricultural sector was not happy with the delays in decision-making. Opperman had taken the matter up with the water and sanitation portfolio committee in Parliament. "From our side the delay is just not on. We said in August we would need to know by mid-October by the latest what would happen with the water allocations so we know where we stand for planning purposes. We're in dire straits here and need our full water allocation," Opperman said. Agri Wes-Cape had commissioned two experts to do some number crunching on the water situation. "Their calculations showed we could get our full allocation this year and so could go back into normal production." The wine, grape and deciduous fruit sectors needed normal water allocation to recover from the drought, and from the recent heat wave. Opperman said the department had models to work out allocations that they should have run on November 1. "We had a meeting on August 24 with the water department and all the municipalities and irrigation boards, and we put our models on the table. It was agreed then that these would be discussed on September 21, but that meeting never happened." Opperman said the full effect of the drought on agriculture would not be properly quantified for the next three years. "And then only if we get normal rainfall years. There are areas that need to be replanted, there are trees that have to brought back into production, so it will be some time before we know the full effect of the drought."